To achieve the highest level of accuracy, IMUs for airborne mapping sensors should be rigidly mounted as close to the sensor reference point as possible. 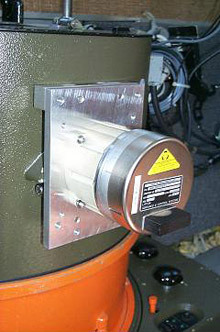 The image above shows an IMU (the cylindrical silver-colored object) mounted on an airborne mapping camera on a NOAA aircraft. Inertial Measurement Units (IMUs) are used in precision navigation of airborne vehicles. IMU technology has been developed and advanced primarily for military applications (e.g., missile guidance) and the space program. This discussion, however, focuses on an important civilian application of IMUs: the direct georeferencing of airborne mapping data, such as aerial photography or airborne lidar data. An IMU uses three gyroscopes ("gyros") and three accelerometers, orthogonally-mounted on an airborne mapping sensor (e.g., camera or lidar system), to measure the current rotation and acceleration. These measurements are summed to determine the change from the initial position of the aircraft. The problem, however, is that accumulating measurements leads to errors that grow with time. Because an IMU is continually adding detected changes to the current position, any error in the measurement is accumulated, leading to an ever-increasing error between what the IMU thinks the position is and the actual position. To solve this problem, global positioning system (GPS) technology is used to provide updates to the IMU. A technique called "Kalman filtering" is used to combine the information from the GPS and IMU, to obtain statistically optimal estimates of the three-dimensional position and angular orientation of the airborne mapping sensor. Using these data and simple geometrical relationships, scientists can determine the coordinates of the remotely sensed data in the mapping coordinate frame. This process of directly relating the remotely sensed data to the Earth is referred to as "direct georeferencing." Abdullah, Q.A. (2004). Photogrammetric Platforms. In J.C. McGlone (Ed. ), Manual of Photogrammetry, Fifth Edition (pp. 705-717). American Society of Photogrammetry, Bethesa, MD. Mostafa, M.M.R. & Hutton, J. (2001). Direct Positioning and Orientation Systems: How Do They Work? What is The Attainable Accuracy? Proceedings, American Society of Photogrammetry and Remote Sensing (ASPRS) Annual Conference, April 23 - 27, St. Louis, MO. Wikipedia. (2006). Inertial Measurement Unit. Retrieved July 14, 2006, from: http://en.wikipedia.org/wiki/Inertial_Measurement_Unit.